Islamic paramilitary camps have been set up in the United States and Canada to train African American Muslims in guerilla warfare. After months of training on firing ranges and obstacle courses, the black Muslims are sent to Pakistan where they receive advanced training in explosives. Many never return. Stories about these camps are not new. They have been reported by the main stream media, including Fox News. The origin of these compounds for would-be jihadis dates back to 1979, when the Agency sent hundreds of radical Islamic clerics to the United States in an effort to recruit African American Muslims for the holy war against the Soviets in Afghanistan. By and large, these missionaries hailed from Pakistan and belonged to Tablighi Jamaat, a Worldwide Muslim movement. Upholding a strict interpretation of Islamic law (shariah), the Tablighi were united in their resistance to Western culture; their insistence that Muslims should avoid contact with all those who do not share their beliefs; and their approval of jihad by sword (jihad bin saif). Members of the movement gathered every year for three days in the small Pakistani town ofRaiwind. 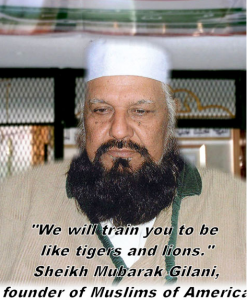 In 1979, Sheikh Mubarek Ali Gilani, a Tablighi missionary from Lahore, Pakistan, arrived in Brooklynwhere he called upon members of Dar ul-Islam, a notoriously violent street gang, to take arms in the great jihad. Scores answered his call and were headed off to Pakistan with payments of thousands of dollars in cash and promises of seventy houris in seventh heaven, if they were killed in action. By 1980, the Agency realized that considerable expense could be saved by setting up paramilitary camps under the supervision of Shiekh Gilani in a rural area of the country. An ideal location was located near Hancock New York at the base ofPointMountain, where the east and west branches of the Delaware River converge to form the headwaters that flow throughPennsylvania and New Jersey to theAtlantic Ocean. The rocky terrain was infested with rattlesnakes, and the woods were home to black bears, coyotes, wolves, and a few bobcats. Islamberg, a seventy acre complex, came into existence. Firing ranges and obstacle courses were set up in Islamberg along with a massive underground bunker and a landing strip. The residents lived in single-wide trailers that lined the hillside. The settlement contained a small shack that served as a laundry facility; a claptrap community center; a tiny grocery store, and a masjid. A sentry post was placed at the entranceway. The camp also came to contain an illegal cemetery where bodies were buried in unmarked graves. This alone should have warranted a raid by the New York State Police. But not even dead bodies could prompt a police investigation. When Islamberg was established, Gilani presented himself as an employee of the CIA and the future jihadis, who resided in the compound, called themselves CIA operatives. Few in law enforcement doubted the professed credentials of the Muslim newcomers. 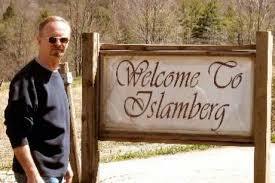 Islamberg was a great success. Hundreds of African American Muslims made their way to Afghanistanand joined the ranks of the mujahedeen. Several were killed in action. Others, including Clement Rodney Hampton-El, returned to the U.S. to plot the 1993 bombing of the World Trade Center in New York. Under the CIA’s directions, a host of other paramilitary camps were established in such places as Red House, Virginia; Commerce, Georgia; York, South Carolina; Dover, Tennessee; Buena Vista, Colorado; Macon, Georgia; Squaw Valley, California; Marion, Alabama; Talihina, Oklahoma; and Toronto, Ontario. Gilani placed Islamberg and the other camps under a governing organization called “Jamaat ul-Fuqra” or “the community of the impoverished.” He established the headquarters of this “charity” in Lahore. The American arm of Jamaat ul-Fuqra became the Muslims of the Americas,” a tax-exempt corporation with Gilani’s mosque in Brooklynas its address. The Soviet withdrawal from Afghanistan in 1989 did not spell an end to the CIA’s support of radical Islam. Throughout the 1990s, Dr. Ayman Zawahiri, al Qaeda’s second in command, travelled at the expense and bidding of the CIA throughout Central Asia, where he cultivated new armies of jihadis to destabilize the newly created republics. His efforts resulted in the uprising of the Chechens against the Russian Federation, the attempted toppling of the government in Uzbekistan, and the insurgence of the Uigurs in the Xinjiang provinceof China. These operations, particularly in the Balkans, required the recruitment of more and more jihadis. Gilani’s camps continued to prosper. And more and more of his African American recruits appeared among the rank and file mujahedeen in various theaters of warfare throughout the world. Dr. Zawahiri’s help was so valuable that he was granted permanent U.S.residence by the U.S. Immigration and Naturalization Service in January 2000. For America, the chief geopolitical prize is Eurasia. . . . Now a non-Eurasian power is preeminent in Eurasia – – – and America’s global primacy is directly dependent on how long and how effectively its preponderance on the Eurasian continent is sustained. . . . To put it in a terminology that harkens back to the more brutal age of ancient empires, the three great imperatives of imperial geostrategy are to prevent collusion and maintain security dependence among the vassals, to keep the tributaries pliant and protected, and to keep the barbarians from coming together. In accordance with the strategy of keeping “the barbarians from coming together,” ISIS forces were and are trained at a secret U.S. military base in the Jordanian town of Safawi. The weapons for ISIS came, compliments of the Agency, from the arsenal of deposed Libyan dictator Muammar Qadhafi. The shipment of these weapons to ISIS in Syria was supervised in 2012 by David Petraeus, the CIA director who would soon resign when it was alleged that he was having an affair with his biographer. In response to the increased demand, Gilani continued to churn out more and more African American jihadis. More and more training camps opened, including one in Texas. More and more bodies were buried in unmarked graves. More and more complaints were made to law enforcement officials. And more and more graduates from the training camps made their way toPakistan. Of course, there was blowback to the CIA’s establishment on Islamic paramilitary camps on American soil. Over the years, numerous members of Jamaat ul Fuqra have been convicted in U/S. court of such crimes as conspiracy to commit murder, firebombing, gun smuggling, and workers’ compensation fraud. Others remain leading suspects in criminal cases throughout the country, including ten unsolved assassinations and seventeen firebombings between 1979 and 1990. In 2001, a resident of the ul-Fuqra camp in California was charged with first-degree murder in the shooting of a sheriff’s deputy; another was charged with gun-smuggling; and twenty-four from the camp in Red House, Virginia were convicted of firearms violations. By 2004 investigators uncovered evidence that purportedly linked both the Washington, DC “sniper killer” John Allen Muhammad and “Shoe Bomber” Richard Reid to Gilani’s group and reports surfaced that Wall Street Journal reporter Daniel Pearl had been captured and killed in the process of attempting to gain an interview with Sheikh Gilani in Pakistan. By 2015, Jamaat ul-Fuqra had been involved in more terror attacks on America soil (30 and counting) than all the other terrorist groups combined. Despite these attacks, the group has never been placed on the official US Terror Watch List, and the Muslims of the Americascontinues to operate as a legitimate non-profit, tax-exempt organization. Investigators, including Patrick Walsh and William Krayer, who have visited Islamberg and other paramilitary settlements, believe that the next major attack on US soil will emanate from Gilani’s jamaats of homegrown terrorism. Based on the history of the CIA’s involvement in the creation of these camps, such an attack may occur in accordance with the Agency’s own design. Dr. Paul L. Williams is the author of Operation Gladio: The Unholy Alliance between the Vatican, The CIA, and the Mafia. Jane I. Smith, Islam in America (New York: Columbia University Press, 1999), p. 161. Douglas J. Hagmann, “Special Report: Jamaat ul-Fuqra Training Compound Inside the U.S.,” Northeast Intelligence Network, February 28, 2006. Paul L. Williams, Crescent Moon Rising: The Islamic Transformation of America (Amherst,New York: Prometheus Books, 2013), p. 134. “Afghanistan Update,” Daily Telegraph (London), August 5, 1983; Los Angeles Times, August 5, 1983. Zachary Crowley, “Jamaat ul-Fuqra Dossier,” Center for Policing Terrorism, March 16, 2005. Gordon Gregory and Sonna Williams, “Jamaat ul-Fuqra,” Special Research Report, Regional Organized Crime Information Center, 2006. Nafeez Mosaddeq Ahmed, “Whistleblower: Al Qaeda Chief Was US Asset,” Huffington Post, May 21, 2013. Sibel Edmonds, “Know Your Terrorists: Ayman al-Zawahiri,” Boiling Frogs Post, February 16, 2013. Rory McCarthy, “The Real Ayman al-Zawahiri,” The Guardian, August 5, 2005. See also Michel Chossudovsky, The Globalization of War (Montreal: Global Research Rublishers, 2015), p. 111. Zbigniew Brzezinski, The Grand Chessboard: American Primacy and Its Geostrategic Imperative (New York: Basic Books, 1997), pp. 20, 40. “Americans Are Training Syria Rebels in Jordan,” Reuters, March 10, 2013. 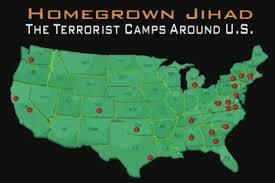 Ryan Mauro, “Islamic Terror Enclave Discovered in Texas,” The Clarion Project, February 18, 2014. “Jamaat ul-Fuqra: Terror Group ofPakistan,”Institute ofContact Management, 2001. “The Jamaat ul-Fuqra Threat,” Stratfor, Security Consulting Intelligence Resources, June 3, 2005. Patrick B. Briley, “AL Fuqra: U.S. Islamic Terror Network Protected by FBI, U.S. State Department, Liberty Post, July 28, 2006.